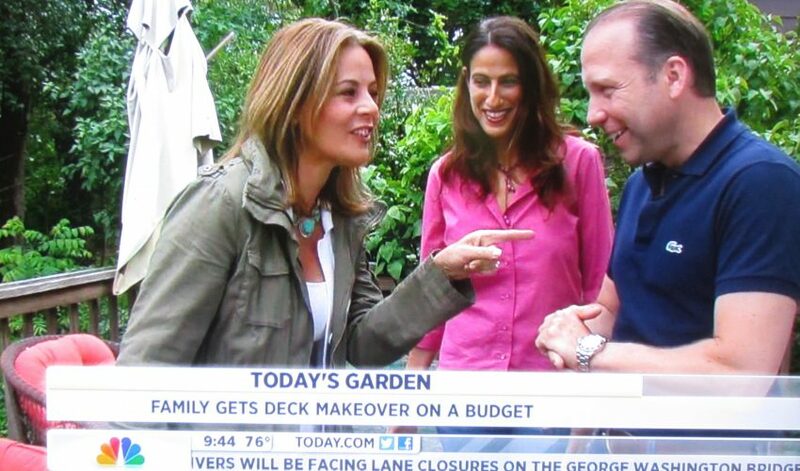 As seen on The Today Show, I was given the design challenge of re-doing a family’s deck for under $250. Read on to see how I did it–and scroll down to see Before and After photos, and click the link to watch the segment. I designed the space to maximize how the family could use it–not just to eat, or sit, or grill, but all three. The overall approach was to take indoor design principles and apply them to the deck, putting the outdoor space together like one would an inside room. Coffee table: found sitting in a dumpster, but missing the glass insert; I found a flooring tile the same size at a hardware store and popped it in. The tall-backed window seat was from a consignment shop for $80 (the most expensive item); I sprayed it the same color as the existing brick wall so it blended in but visually broke up the expanse of wall. Both functional and decorative. Sconces on the pillars of the deck: made from lids to the galvanized buckets that were used for planters — lids were simply folded at 90 degrees and nailed to the beams, filled with pebbles and votives to create casual ambiance. Dining table setting: Super inexpensive placemats made from sheets of moss for crafts. Napkin rings were made from the Laundry line. Napkins were 4 for $1 at a tag sale. Mason jars from a tag sale become drinking glasses. Candelabra was made from a stray birch log, with 3 holes drilled in it to accommodate candles. Grill area: Used existing grill, but added a work surface/extra seating using a stool found sitting in a dumpster; stool was in good shape, someone just didn’t want it anymore so no repairs needed. I sprayed it white after using painters tape to create a decorative pattern on top. Decorative items: Moss balls were made using the leftover sheet moss used for the placemats! And I found 4 armillary (metal garden orbs) in a dumpster; they were rusted, so I sprayed them with the same high gloss paint used on the dining set. AC unit became a great ledge for plants; 2 terra cotta pots with variegated trailing ivy. Lighting: lots of natural sunshine! Free!